We might think of St Francis of Assisi as the original saintly animal conservationist, but while he merely(!) preached to the birds, Durham’s St Cuthbert is popularly believed to have taken steps to ensure that some of Northumberland’s eider duck population enjoyed his personal protection. This post examines the development of that idea and what it suggests about the the range of potential attitudes and relationships to saints. There are a number of animal stories attached to St Cuthbert. 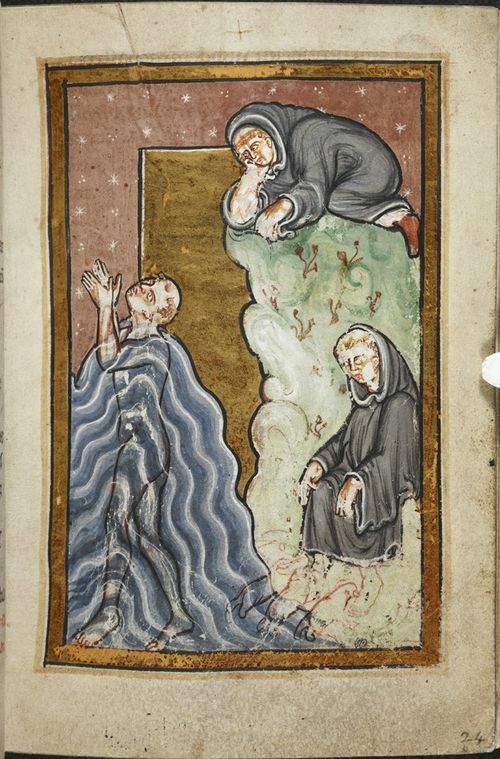 A famous episode in Bede’s Life of the saint involved Cuthbert standing neck-deep in the sea and praying, after which two otters came and dried his feet with their fur. The animals were rewarded with a blessing, and went on their way. In another story Cuthbert’s horse, who he calls ‘comrade’, finds the saint some food (in a peasant’s house!) and the two share it. As Dominic Alexander points out in his wonderful work Saints and Animals in the Middle Ages these tales are not meant to show Cuthbert’s ‘kindness’ towards animals, but how his sanctity has caused him to return to mankind’s state in the Garden of Eden, where animals instinctively obey him and work for him. They are also not unusual – the meek obedience of the natural world to saints was a common theme which proved the latters’ holiness. Perhaps the animal most associated with St Cuthbert today is the eider duck, or Cuddy duck (Cuddy being a shortened form of Cuthbert). The first we hear of their association with Cuthbert is in the twelfth century, 500 years after his death. The monks of Durham had a small cell and chapel on the island of Inner Farne, which they shared with a large nesting population of eider ducks. Cuthbert is said to have tamed these ducks so well that they would nest everywhere, even next to the chapel altar, without fear. Cuthbert had also placed the ducks under his protective grace, so that no-one should eat or even disturb them. The ducks can’t have remained entirely unmolested by the monks, as we can note the appearance in inventories made of Cuthbert’s shrine at Durham of cushions made of ‘Cuthbert doun’ – downy feathers from St Cuthbert’s eider ducks on Farne! Perhaps the sacred purpose of the plucked feathers excused the necessary disturbance to the ducks. Certainly, other monks who had eaten or harassed Farne’s eiders were struck down by Cuthbert’s curse, one even dying after mocking the saint’s protection. The association with place is very strong. 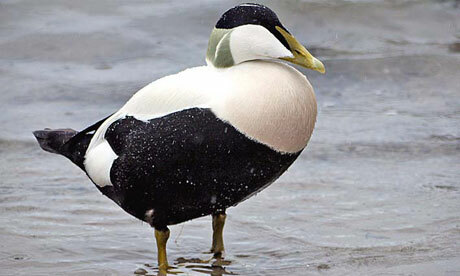 Only the ducks of Inner Farne were protected, eider ducks on the other islands were not. This marked Farne, where Cuthbert had been a hermit, as a site of particular holiness, where everything on the island (mainly monks and ducks) was under his personal and powerful protection. There do not appear to be any medieval artworks depicting Cuthbert with ‘his’ ducks, suggesting that historically his protection of the birds was secondary to the protection of the island as a whole. Why these ducks, then? It’s clear from medieval accounts that the protection of the Farne eider ducks was not a result of any inherent sanctity on the part of the animals or as a reward for any deeds done by them, but stemmed specifically from Cuthbert’s own power as a type of saintly lord of the region. Farne was sacred to him, and he is seen as holding it as a personal fiefdom from God, able to institute his own laws and enforce them with divine punishments. Much as England’s swans on the Thames and its tributaries are the property of the Crown, so the eider ducks on Farne were the property of St Cuthbert. This is a feudal idea of saintly authority and protection, very different to the innate privilege of a ‘sacred cow’. Cuthbert’s unusually strong protection of this island is a microcosm of his position as saintly protector of the whole north-east of England. It is also indicative of the reasons for Cuthbert’s unusually enduring status in the north-east after the Reformation, as the long-established protector of ‘his people’ of the north-east. The continued association of Cuthbert with place in the north-east is evident in a tradition that probably arose in the seventeenth century on Holy Island, another important Cuthbertine site, where fossilised crinoids – sea creatures whose remains look like pierced stone columns – were called ‘Cuthbert’s beads’ and supposed to be from his rosary. Because they were found on Holy Island, the locals knew they must be related to Cuthbert. As the region became more integrated with the nation and less under threat, the importance of Cuthbert as protector of his people waned. Although he never entirely lost the association with place it was another aspect of his cult that came to the fore. In the 19th century, with the birth of the animal rights movement in Britain and the founding of what was to become the RSPCA and the RSPB, Cuthbert was seen as a protector of animals and, shorn of its context, as the creator of one of the earliest animal sanctuaries on Inner Farne. 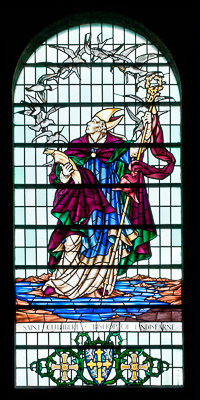 A number of artworks and windows from the late 19th century show Cuthbert in this environmentalist guise, and even in Durham cathedral itself the main depiction of Cuthbert in the window glass is a mid-20th century depiction as benevolent protector of birds. His fierce regionalism is toned down in favour of a softer animal-friendly persona which fitted with the times. The late 20th century saw a rise in regionalist movements within the UK, and saints were frequently co-opted to the cause. Thus amongst others St Petrock in Cornwall, St David in Wales, and St Cuthbert in Northumberland, have all experienced a renaissance of popularity as regional pride has blossomed. It is, perhaps, this adaptability to the needs of the times on the part of saints such as Cuthbert that account for their continued success even within the Anglican church.